Burgess/TMB Planetary Eyepieces - "Making Awesome Affordable"
Illustration courtesy of Burgess Optical Co.
Burgess Optical is owned and operated by Bill and Tammy Burgess and is located in Knoxville, Tennessee, USA. Burgess Optical products are manufactured to Bill's specifications both overseas and in the United States. They are a small operation that markets a couple of refractor telescope models, an astronomical binocular, a finder, tripods, mounts and the Burgess/TMB Planetary ocular line that is the subject of this article. Burgess/TMB Planetary oculars were designed in cooperation with the late optical designer Thomas M. Back, who prematurely and unexpectedly passed away in 2007. Mr. Back founded TMB Optical and was perhaps best known for his long focal length APO refractor telescopes intended for planetary viewing. This is a line of short focal length, flat field, high-resolution oculars intended for planetary viewing and similar applications. Focal lengths include 2.5mm, 3.2mm, 4mm, 5mm, 6mm, 7mm, 8mm and 9mm. "The typical eyepiece today is designed for wide-field views of deep space objects (DSO) . . . To achieve these nice, wide field views, design choices have to be made, such as using a large number of elements and groupings of elements. These design choices sometimes result in lateral color aberration (color fringing) and light scatter (seen as a halo or glow around bright objects). When observing a dim DSO, lateral color and light scatter in the typical eyepiece are rarely seen . . . If there is a bright star near the edge of the field, then lateral color and light scatter might be seen when observing dim DSOs. But, the lateral color and light scatter would be associated with the bright star, not the DSO." "The design choices for typical wide-field eyepieces are different than the design choices for a planetary eyepiece. The typical eyepiece is optimized for wide-field views of DSO and suffers when viewing very bright objects, particularly off-axis." "A planetary eyepiece is optimized to view bright objects while showing maximum detail and definition. It is an eyepiece with very high light transmission, very high contrast, minimal lateral color and minimal light scatter. For Dobsonian users and others without tracking drives, lateral color and other aberrations are minimized to allow the planet to drift across the field of view while still being sharp and having high contrast. Also, because lunar and planetary observers seek to see as much detail as possible, planetary eyepieces typically have a short focal length for high magnification." The Planetary oculars feature a 60-degree apparent field of view (AFOV), 16mm of eye relief and twist up eyecups for optimizing eye relief with a fold-down rubber eye (or eyeglass) protector on top. The upper eyepiece barrel is the same diameter for all focal lengths; it measures 43.8mm in diameter. The lower mounting barrel diameter is 1.25" and it incorporates a wide safety band to reduce the chance of losing the ocular if your star diagonal's retaining screw loosens. The overall length varies, with the shorter focal lengths being physically longer. Planetary 9mm with eye cup up and down. Illustration courtesy of Burgess Optical Co.
All lens elements are fully multi-coated to maximize light transmission and minimize internal flare. The inside of the mounting barrels is fully baffled and even the internal spacers have micro baffles to reduce reflections. They are supplied with top and bottom lens caps. The retail price direct from Burgess Optical is a reasonable $99 each, which makes them surprisingly affordable compared to similar quality, premium oculars. 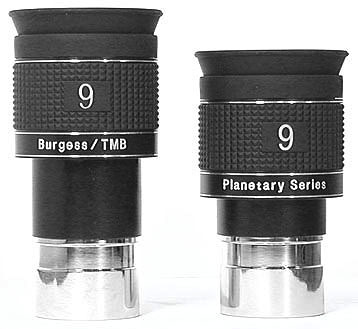 Externally, the Burgess/TMB Planetary oculars wear a matte black finish with a wide, checkered rubber grip ring. Three silver accent lines are engraved around the bodies, along with the words "Burgess/TMB" and "Planetary Series." A number representing the focal length is printed on opposite sides of the rubber grip ring. This number is large enough to be read at night by the light from a red flashlight, a nice touch. After the pre-production prototype Burgess/TMB Planetary oculars were in hand, Thomas Back wrote that he had star tested the 4mm focal length against a Zeiss Abbe Ortho and a Tele Vue Radian. He was very satisfied with the result, finding the Burgess/TMB clearly superior to the Radian in scatter and only slightly inferior to the Abbe Ortho. In sharpness, the Burgess/TMB was equal to the Zeiss ocular. The apparent field is the same as the Radian and the eye relief is only 4mm less, both being considerably greater than the Abbe Ortho. The Burgess/TMB retails for less than half the price of a Tele Vue Radian and even less compared to the Zeiss Abbe Ortho. Between us, the members of the Astronomy and Photography Online staff own all of the available Burgess/TMB Planetary oculars, except the 2.5mm. Physically, the shorter the focal length, the longer the ocular. The popular 7mm Planetary, for example, is about 72mm long with the rubber eyeglass protector folded down. It weighs 5.5 ounces (without caps), per our digital scale. The ocular lens is about 21.5mm in diameter making it easy to look through. The Burgess/TMB eyepieces performs exactly as described above. They present contrasty, flat field views that are sharp from edge to edge. We find the 60-degree AFOV to be ideal and could find nothing about which to quibble. All Burgess/TMB Planetry eyepieces have the same 60-degree AFOV and 16mm eye relief. From the user's point of view, unlike most ocular designs, it is just as easy to look through a 4mm Planetary as a 9mm Planetry. Unlike Plossl or Ortho oculars, you can simply buy whatever focal lengths the light grasp of your telescope and the anticipated seeing conditions will support, without concern about tiny exit pupils or eyelash-length eye relief. Copyright 2009, 2012 by chuckhawks.com. All rights reserved.